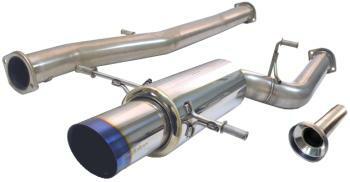 This complete system includes a full SUS304 stainless downpipe and cat delete pipe that have thicker construction to withstand the heat of extreme exhaust gas temperatures. The catback portion of this system features lightweight SUS304 piping with a specialized full Inconel tip. Tailored for turbo car driver who enjoys boost.